Because standard is just too common. Sometimes you just want to have something special. Something you are passionate about. Something that says a lot about who you are. And standard items just won’t cut it. Enter the world of Montblanc Creation Privee which offers bespoke personalisation for discerning individuals. 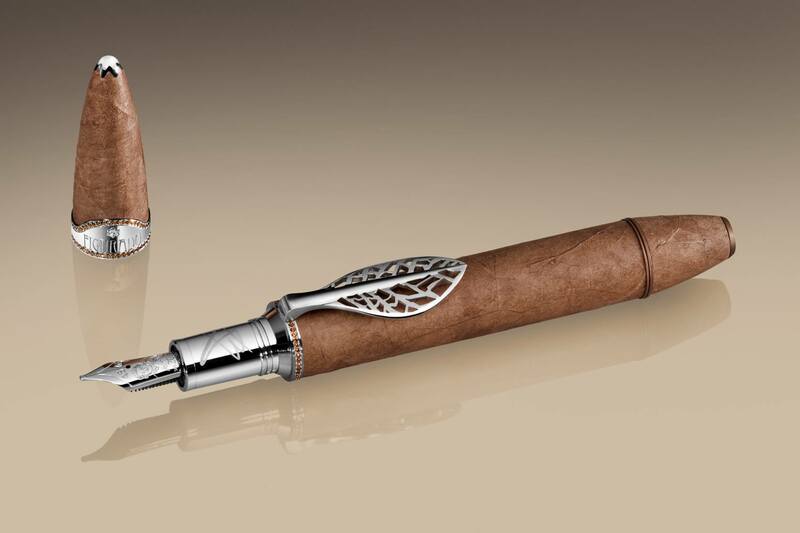 The Montblanc Figurado Creation Privée piece is a one-of-a-kind writing instrument crafted from tobacco leaves, inspired by its owner’s passion for cigars. 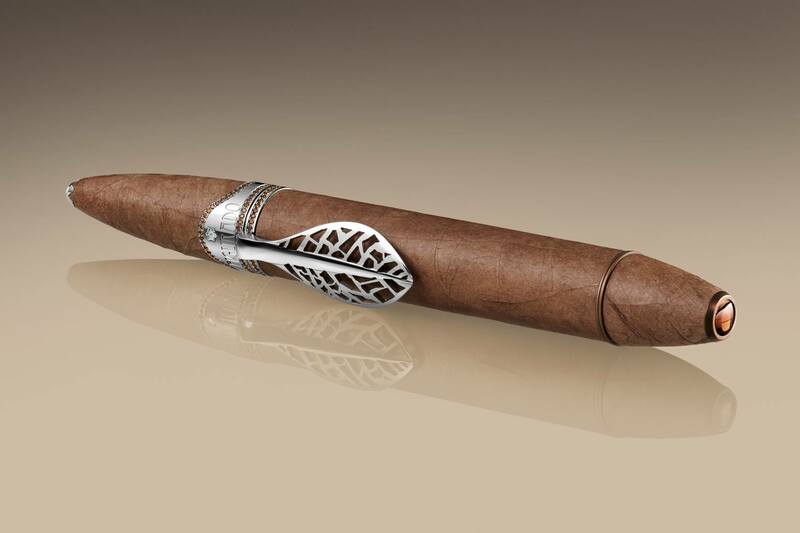 This piece was the result of the creative collaboration between Montblanc and its owner, the Figurado Creation Privée, and is custom-designed to mirror the shape and look of an exceptional cigar with the cap and barrel of the writing instrument covered in the finest cigar leaves. For every Montblanc Creation Privée, designers and artisans work closely with the owner throughout the manufacturing process, interacting regularly on the most minute design details and offering progress updates via webcam. New techniques were explored to bring this dream to reality: from extracting the oil from the leaves before masterfully wrapping them around the metal body of the fountain pen, to protecting them with a cellulose coating similar to the one used for the restoration of old paintings, and covering them with an emulsion of several lacquers. The Artisan Atelier designers have re-imagined a custom-designed banderol wrapped around the fountain pen. The instrument was crafted like a writing jewel using the finest materials and features a retractable Au 750 gold nib, a precious tourmaline in the cone, white gold fittings set with tourmaline stones and a Montblanc diamond on the cap top. The Montblanc diamond in this Creation Privée is unique, and takes its unusual shape from the brand emblem created over 100 years ago as a symbol of the highest standard of craftsmanship inspired by Europe’s highest mountain. With this creation, the Mont Blanc massif, with its six snow-white glaciers, has now been captured in diamond, crowning a one of a kind writing instrument. Because this precious writing instrument is best stored under constant climate conditions due to its organic nature, a special humidor-style presentation box was crafted from the finest wood with a glass viewing panel so the fountain pen can be admired without having to open the box. 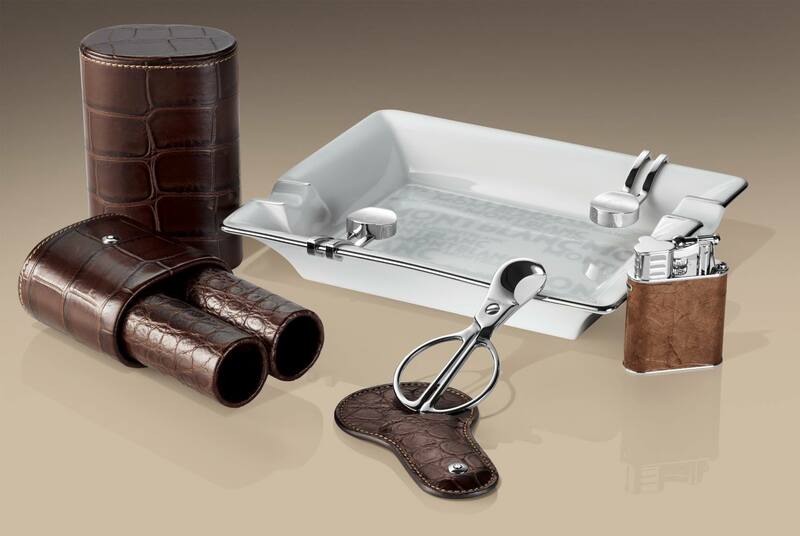 The writing instrument is safely stored inside a dedicated compartment alongside the owner’s collection of rare cigars, and an assortment of handcrafted accessories designed to accompany the cigar-shaped writing instrument including a traditional cigar holder, a tobacco leaf lighter and an ashtray. Montblanc Creation Privée focuses as much on the process as it does on the finished product. Because being able to watch one’s own vision transformed into an outstanding writing instrument is very fascinating indeed, future owners of exclusive personal edition writing instruments crafter by Montblanc are invited to follow selected fascinating steps of the creative process via webcam witnessing in real-time the most experienced artisans, jewellers, diamond setters, engravers and nib finishers devoting all their passion and skill to creating a true masterpiece. Montblanc pays tribute to the legendary Minerva chronographs with a brand new 1858 Chronograph Tachymeter Blue Limited Edition 100, combining the reference in chronographs with the innovations of the present. This exquisite timepiece pays tribute to the heritage of its manufacture in Villeret, founded under the name Minerva and acquired in 2007 by Montblanc. The prestigious Minerva manufacture was the reference in the field of chronographs and stopwatches during the 1920s and ‘30s. These legendary timekeepers were able to measure fractions of a second with the utmost precision — a feat of horological manufacturing for the time. Calibres such as the reference 13.20, launched in the 1920s, were among the very first to be conceived specifically for wristwatches, while the Calibre 19.14, unveiled in 1936, could measure the hundredth of a second. Montblanc’s split-second stopwatches also gained international recognition when they were used for timing the 1936 Winter Olympics, which reinforced the Maison’s reputation. Most watchmakers outsourced their watch components throughout those two decades, whereas Minerva mastered the majority of its fabrication in-house, including its balance wheels and springs…and the same remains true today. This year, Montblanc continues this passion for fine watchmaking by honoring Minerva’s emblematic chronographs of yesteryear with a new manufacture 1858 Chronograph Tachymeter Blue Limited Edition 100. Inspired by a monopusher chronograph from the 1930s, this new limited edition of 100 pieces captures the innovative spirit of the decade by uniting a number of the original design features with one of Villeret’s most elegant manufacture, hand-wound chronographs— the Calibre MB M16.29 — featuring a column wheel and a horizontal disc clutch. 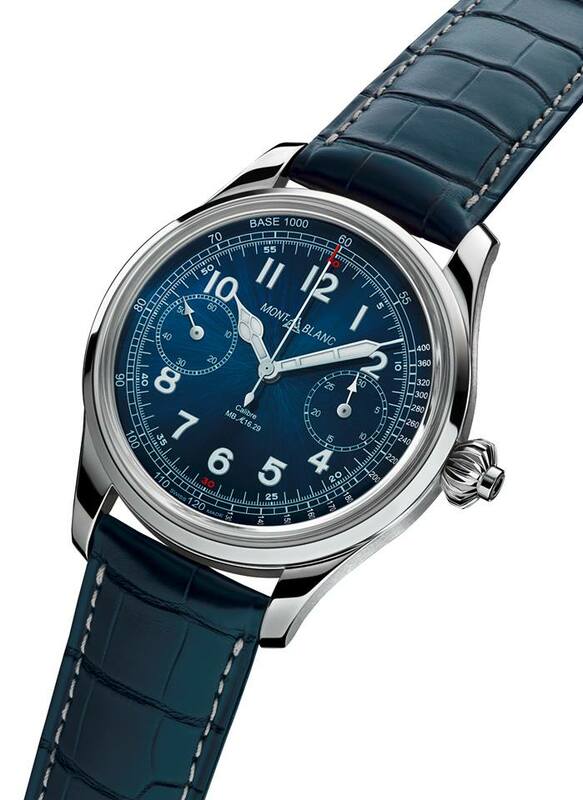 Montblanc’s 1858 Chronograph Tachymeter Blue Limited Edition 100 celebrates both traditional Swiss artisanal watchmaking and the rich heritage of Montblanc’s Villeret Manufacture, but offers a contemporary twist to the past with a large 44 mm stainless steel case with slightly enlarged lugs, to keep the proportions of the case the same. The addition of a deep blue dial with a tachymetric scale for measuring speeds over distance, along with a matching blue alligator strap, also contribute to reinforcing the vintage look of this historical timepiece. 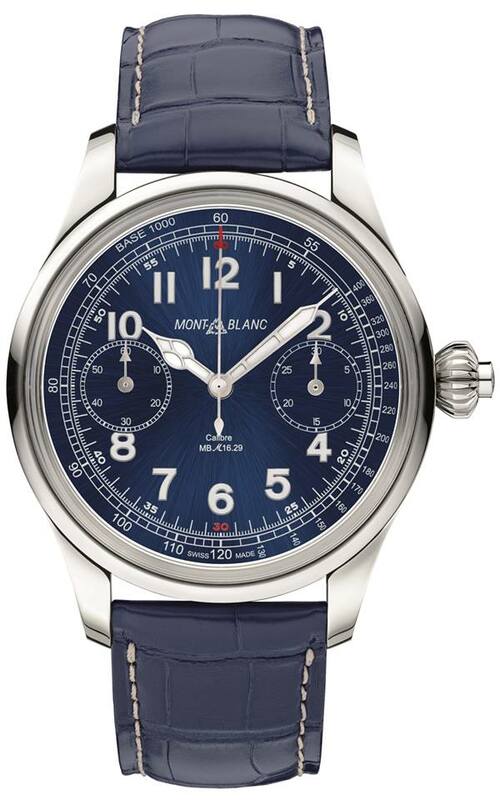 Under the dial, Montblanc has equipped the 1858 Chronograph Tachymeter Blue Limited Edition 100 with its monopusher chronograph with column wheel and horizontal disc clutch that fills the whole 44 mm case. This movement shares the same architecture as its predecessor — the Minerva pocket watch Calibre 17.29 from 1929 — although it has been re-designed extensively with hand-finishings, including Côtes de Genève motifs, extensive bevelling, angling and snailing, all respecting the finest codes of Haute Horlogerie. Looking through the caseback, it is possible to see the iconic engraved “V” chronograph bridge, which has been a feature of Minerva chronographs since 1912, as well as the Minerva arrow-shaped chronograph hammer that can be found in almost all the modern Montblanc/Minerva movements. Other features include a large screw-regulated balance wheel and a swan-neck regulator. The calibre is comprised of 252 components and beats at a frequency of 2.5 Hertz with a power reserve of 50 hours. Montblanc timepieces, writing instruments and other products are available at the Montblanc boutique at Level 2, Pavilion Kuala Lumpur.